Scurrying around the great wall was a little tiger girl. With her ears and tail popping out no one could mistake that this was indeed Taoxin. The girl's eyes gleamed yellow and she just gave out that aura which made her seem more elegant than a normal person. As she walked down the walls, her white hair practically floated in the cool wind that was blowing, accented with purple lights. The symbol peered down below, watching other troops. For a second she felt as though she could fly. But who was she kidding, she was not the vermilion bird. Eyes closed and deep in thought, she dreamed of soaring through the breezes. "I wonder what it's like to..fly." She whispered. Jiang was in his creature form and that is the Azure Dragon. He was flying through the winds when he reach the Wall of China, It was really a magnificent structure created by many men of China. He soared though the breezes and saw a little girl walking. He landed aside of the hill and turned to his normal and true form. He walked and approached the girl. "Hello!" Jiang said. He stared at hate girl who kind of sad. He tried to smile but he feels uncomfortable to approached her like this. "I'm Jiang." He added. Staring warily at her. He feels somethings was making her feel kind of sad. While waiting for the girl to reply. He just stared at the men who were patrolling the wall. Taoxin's eyes met the ones of another person. He couldn't possibly be one of her castle guards. She didn't feel quite comfortable like this. Especially since she was the emperor's daughter she wasn't used to people just bumping into her, especially since this place was the greatwall. "I'm Jiang." The boy introduced. "Er...I'm Taoxin." Did he not know her? But then again, she had been kept away from all access to society until just recently. This was the first time she has met an outsider so she didn't really know how to react. Swinging her tail back and forth, back and forth kept her from being to nervous. "Er..I'm Taoxin." She said feeling kind of nervous. Jiang looked at her suspiciously its like she's afraid of something. "Is there something wrong?" He said studying Taoxin's face. She was a very beautiful girl, with all those dress and all, she looks pretty elegant but one tinsey winsey mistake was inherited the girl's face...she's sad. Seeing as this guy was carefully eying her, Taoxin felt a bit self-conscious. What, is there something wrong with my face?She wanted to say but kept her mouth shut. Babbling about things like that is something princesses shouldn't deal with. She didn't want to snap so she held it in. "Is there something wrong?" She asked rather impatiently. She was used to demanding people to get her way and absolutely refused to be let down about something. About anything. "Oh!" He suddenly realized he was staring so seriously at the girl's face. Jiang really felt he's blushing. "Uhm,..Err.. Its not a really good thing to see a precious face with a very sad expression." He said as he looked away to Taoxin's face, feeling kind of embarrassed of what he's done. "A sad expression, huh? I'm not sad, or at least I don't think I'm sad." Taoxin replied speaking aloud. She wasn't sad, she just had the desire to fly and seeing Jiang's blushing face made her giggle. "My father is the emperor of China, you know? I was just wanting to see what it's like to be outside. You see I am one of the five symbols. Father doesn't want me to be one but you can't change destiny." Taoxin whispered. She smiled slightly swaying her tail back and forth feeling it hit the ground lightly. Her tiger ears twitched slightly hearing the guards on patrol. 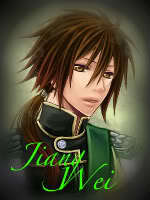 "That means..." Jiang was surprised. He never thought of it that he would meet some kind of princess here. "You're the emperor's daughter?!" Jiang said feeling so confused and sorry for what he have done earlier. "I'm sorry, princess" He bowed. "You said your one of the symbols?" He asked and again he studied her for a quick second. "You're the white tiger." He added. "Allow me to introduce myself ." He transformed into his creature form. He can feel that his body is changing, he started to grow a tail, his arms was not there but wings were replaced by it. Then he flew a bit in the fields and back to Taoxin. I know you know me now, "I'm the Azure Dragon." Jiang said and grinned. "You're the azure dragon?" The princess herself was shocked. She was a bit envious of the man for being able to fly, but she kept the enviousness to herself. "Must be nice to fly, huh?" She thought aloud in a cool, yet calm, voice. No trace of enviousness there, she assured herself. Jealousy was dreaded from the emperor's daughter. He smiled while staring at Taoxin's face. He felt kinda relax. "Oh! About Flying? It's very awesome but sometimes its very tiring in a way." Jiang said. Flying was Jiang's favorite kind of hobby but still, He doesn't want to take advantage of the power sometimes its very tiring of transforming and flying all over China. Taoxin giggled, coiling her tail around her waist smiling slightly. Her eyes glittered at the thought of flying all around China. It must really be nice to feel the cool windy breeze, and she remembered a song one of her father's singers sang. "Tiring, huh? Still..." She whispered the still, not wanting to sound weird. She wanted to fly more than anything in the world, and this guy had the opportunity to do so. "Want to fly with me?" He said at the emperor's daughter and grinned. "What?" Taoxin was shocked at the proposal but it was something she couldn't refuse. She blushed at the thought but how is it possible to take someone up with you in the sky? "I'd love to, but won't I be heavy?" She asked. A princess always had to watch her weight so that she wouldn't be embarrassed to do things like this. "What?" Taoxin said. Jiang giggled at her expression. She seems kind of cute. "Just wait a sec.." He said then transformed into his creature form. Again he transformed into an Azure Dragon. "Don't Worry. I'm a symbol" He said trying to smile cause he knows that Dragons can't smile. "Erm, what am I supposed to do? Climb on your back or something?" Is this like riding a horse? Was what she would've said but she ignored sarcastic remarks. After all, he was a symbol like she was and she shouldn't be rude to symbols. She was frightened now. But if she did fall, she knew she would land on her feet. Like all cats would. But no cat has fell from a thousand feet in the air. She was still a bit afraid. The Little Tiger Girl hop on the dragon's back and in just a nick of time. They're flying. China hasn't been this much beautiful as it does last time. Wars, everywhere but now its a very beautiful scenery. Crops grow peacefully in the fields, Lakes has plenty of fishes etc. "Don't worry but...hold on" He said as he glided but still he knows his limits when someone is riding him. "The view, it's breath-taking!" She gasped as she saw everything. The crops, the lakes, the fields! Oh she could just do this forever. Her eyes had tears in them that quickly evaporated in the air. She started to wish that tigers could fly. "Oh okay." She said, holding on a bit tighter than she was. If she was daring she would raise her hands in the air. But since this was her first time, she didn't dare to do it and instead gripped on. He was really happy about seeing this views. He slowed down a bit to prevent Taoxin from falling. He passed trees, hills, rivers, birds we're flying too. Some of the birds that Jiang doesn't know what it is called. "What can you say Taoxin?" Jiang asked, wanting to know the girl's reaction. "I have to say, it's beautiful. Thank you, Jiang" Taoxin said. No one can replace the scenery here. Not even her father. It was just so, so amazing. The birds passed by, nightingales and cranes and others. They were heading for the clouds and Taoxin just had to feel them. They felt like water vapor, and moved out of place as she touched them. "This is the first time I've felt really...free" She said, laughing. Taoxin made Jiang smile because of what she said. She's right for China is really beautiful. "Don't mention it." He said satisfied for at least someone appreciated Jiang. "Haven't you explored China before?" Jiang said feeling sad for the girl, maybe its really hard to be a child of an emperor, especially of you're a daughter. "I've accompanied father in many of his trips. But they weren't far from the palace. This is the first time I've seen all of it, because father worries about me. Since I'm his only daughter he doesn't want me to get hurt. Especially since I'm a symbol." Taoxin said. She was indeed not talkative about that, but since Jiang was a symbol she figured she could tell him. She knew that to put the fiends to sleep one would have to risk their own life and that was what her father is truly scared of. But what she didn't know was that one had to die to put the fiends to sleep and not just risk her own life. "Well, this is your first time, why don't we make it more memorable." Jiang said, at least to make Taoxin smile. He landed in somewhat a meadow like. "Maybe we could just rest here for a bit." He picked some apples and gave to some to Taoxin. He saw a little pond surrounded by beautiful flowers. In the meadow there is a pond, bushes and flowers grow anywhere, trees look so healthy. "Thanks, Jiang." Taoxin said as he gave her the apple. She held it in her hands, then took a bite out of it. She was savoring the sweetness of the fruit and saw the pond Jiang was looking at. It was indeed a pretty pond, everything looked healthy. Oh how she would love to go in there, but she didn't dare want to ruin her attire. Thinking fast, she quickly transformed as Tiger fur was easier to dry. She started with her claws, then swiftly changed her body into that of a tiger. She could feel her face molding, and finally she was on the ground on all fours. "I'm a tiger, here me roar." She joked rushing over to the pond and jumped inside it. There were no frogs though, only the lily pads and that made Taoxin happy. "Don't mention it." Jiang said and grinned. He noticed that Taoxin is changing, he was stunned, he immediatly grabed Vapor. Vapor is his weapon. A Two bladed trident. He was surprised that it was just Taoxin transfromed into a tiger. He chuckled. "Just swim there a bit. While I take a nap but we can't stay longer here Taoxin. " He said thinking of what would the emperor would think someone had kidnapped her daughter. The wild isn't good for an emperor's daughter to roam around. Hey, she's a symbol what can we do. He smiled at the tiger. "Okay" She meowed as she splashed around giggling. She could never do this at home. Home, where all the rules were. Then she had an idea. She would runaway and never go back home. She could go to the Kunlun mountains, or better yet somewhere where her father would never look. She quickly jumped away from the pond and was now back on dry land. She dried herself by shaking herself. Then she quickly changed back to her human form. Her hair was a bit out of place so she turned her hands back into paws. She extended her nails and used them as combs to brush out her hair. Then once her hair was smooth she changed back.